Consultant Surgeon Abeezar Sarela specialises in Upper Gastrointestinal Surgery, also called Upper GI Surgery. The human gastrointestinal tract can be divided in to an upper part that consists of the oesophagus (food-pipe or gullet) and stomach, and a lower part that consists of the large bowel. 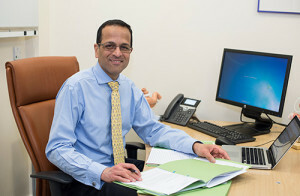 As an Upper GI Surgeon, Mr Sarela specialises in operations on the oesophagus (or esophagus) and the stomach. Upper Gastrointestinal operations are of three types: 1) Operations for Weight Loss, called Bariatric Surgery. These are different types of operations on stomach, to reduce hunger and to increase fullness after meals. 2) Operations for Cancer of the Oesophagus and Stomach. 3) Operations for functional disorders of the oesophagus and stomach. ‘Functional disorder’ means that there is some problem with the functioning or working of the oesophagus or stomach, but there may not be any structural problem. A common functional disorder is acid reflux (called gastroesophageal reflux disease or GORD or GERD). Less common functional problems are achalasia cardia and gastroparesis. Although the underlying medical conditions are different, the common theme of upper GI surgery is that all operations are on the oesophagus and stomach. Technical skill is an essential part of surgery, and focus on the oesophagus and stomach promotes excellence in outcomes. In order to do an operation, the oesophagus or stomach can be reached in two ways. The conventional way is to make a long cut on the abdomen (tummy) or chest: this is called ‘open’ surgery. Nowadays, in almost all cases, the preferred way is by Laparoscopy, also called Keyhole Surgery or Minimally Invasive Surgery. Laparoscopy has many advantages over open surgery. Mr Sarela is an expert in laparoscopic surgery. He does all weight loss operations and functional operations by laparoscopy. For cancer operations, the choice between laparoscopy and open surgery is tailored individually. Through his expertise in laparoscopy, Mr Sarela also specialises in hernia surgery. Like other areas, there are many benefits to do hernia operations by laparoscopy. Similarly, Mr Sarela has considerable expertise and experience in laparoscopic surgery for gallbladder stones (gallstones). Mr Abeezar Sarela was appointed as a Consultant Surgeon in the Leeds Teaching Hospitals NHS Trust in October 2003. He works at St James’s University Hospital, Leeds. His private practice is at the Nuffield Hospital Leeds and the Spire Hospital Leeds. He worked full-time in the NHS until 2010, and then reduced his NHS work to 50% part-time. As a result, he can give closer personal attention to his private patients and focus on his studies in medical law. In parallel, he continues to care for patients and participate in activities of the NHS. Mr Sarela does the same set of operations in the NHS and in the private hospitals. The NHS is a great institution. The Nuffield Hospital Leeds and the Spire Hospital Leeds are very well equipped and give excellent care for many conditions. But, certain types of major operations and post-operative care are done best in a large NHS hospital, such as St James’s in Leeds. As an NHS consultant, Mr Sarela is involved in continuing professional development activities, teaching and training, research, clinical audit and regular appraisal. Mr Sarela works independently as a private healthcare professional in only two private hospitals: Nuffield Hospital Leeds and Spire Hospital Leeds. Mr Sarela believes firmly that he can offer the best service to his patients by establishing a direct relationship and by providing personal post-operative care and follow-up. Presently, he does not work outside of Leeds. Previously, he was a visiting consultant in Bariatric Surgery at Hinduja Hospital, Mumbai, India (2010-2014). Mr Sarela read medicine at the Seth GS Medical College, Mumbai, India (Mumbai University) and graduated (MBBS) in 1991. He completed General Surgery training in Mumbai, at the King Edward VII Memorial Hospital, and he gained the qualification of MS from Mumbai University (1994). Mr Sarela was a Gold Medalist at the MBBS and MS examinations. Mr Sarela then went to the Royal Postgraduate Medical School (now part of Imperial College) & Hammersmith Hospital, London, in 1995, through a scholarship from the Association of Commonwealth Universities. He obtained the diploma of MSc in Surgical Science (with distinction) from the University of London in 1996. He then worked as Registrar in Surgery at Ashford Hospital in Middlesex (1996-1997). In October 1997, Mr Sarela was appointed as a Lecturer in the School of Medicine, University of Leeds, and an Honorary Specialist Registrar in Surgery at St James’s University Hospital, Leeds. He undertook research in the molecular genetics of bowel cancer, and trained simultaneously in gastrointestinal surgery. His research led to the award of the degree of MD by the University of Leeds. He passed the Inter-Collegiate Examination of the Surgical Royal Colleges in 2001, and was awarded the qualification of FRCS. In July 2001, Mr Sarela was selected for the highly competitive International Surgical Oncology Fellowship at Memorial Sloan Kettering Cancer Centre, New York, USA. Mr Sarela trained in cancer surgery in New York during 2001-2002. After completing fellowship training, Mr Sarela returned to Leeds and he was appointed as a Consultant in Upper GI Surgery in the Leeds Teaching Hospitals NHS Trust in October 2003.